AppControl is a new tweak for jailbroken iOS devices that allows users to have different settings for each app. Using its gorgeous user interface iOS users can access a number of settings and configure them for any specific app. The best thing about this tweak is that it makes it possible for users to have settings for apps that can otherwise only be changed universally on iOS. Using AppControl you can change the the name of the app, which is not possible on iOS by default. You can also enable a password that will only be used for that particular app, so you can have different passwords for different apps if you like. 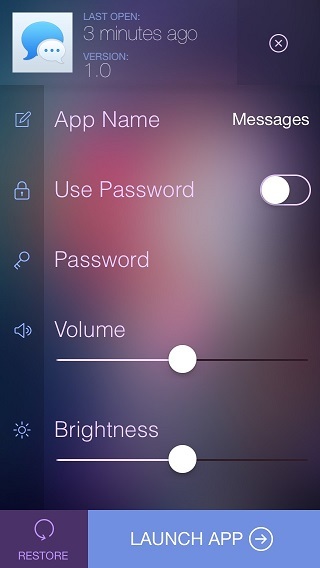 Another cool feature of this tweak is that you can set custom brightness and volume levels for applications. So if you like to have brighter screen for any game and lower brightness for a reading app, you can do it using AppControl. Same goes for volume levels. The tweak also has some extra features that includes ability to show information about app’s version number and when it was last launched. AppControl page can be accessed by swiping the finger on app’s icon. The developer of the tweak has promised some additional features for the future updates as well including ability to hide notifications, change icon image and app specific APIs for developers. You can download AppControl tweak from Cydia’s BigBoss repo for $1.99.